Smartphones have never been more advanced, and it’s possible to get a device with some serious power for a pretty affordable price. For those who just want the basics, however, the Galaxy J2 Pro may be just the ticket – just don’t expect to be able to browse the web. The idea of a smartphone without any internet access brings into question whether or not the phone is truly “smart”, but the Galaxy J2 Pro still has the basics down pat. With a 5-inch QHD AMOLED Screen, you’ll have a great image quality for the content you’d like to watch off of your microSD card, but you won’t be able to get online to watch your favorite YouTube videos. It’s an interesting decision on the part of Samsung and focuses the Galaxy J2 Pro on a very specific market – but that market may very well be big enough to warrant the development of a more basic smartphone. The main market for the Galaxy J2 Pro, according to Samsung, are those who don’t need all the bells and whistles that modern smartphones offer – most notably the elderly, parents who want to give their kids a basic cell phone, and students who want a way to interact with their family and friends without the distraction that an internet connected device offers. Students are incentivized even further to purchase the phone, with the company promising all students taking the 2019/20 College Scholastic Ability Test the ability to trade the phone back in for an S device later one., The decision to make a smartphone without any internet access is a bold one, especially when there are internet-connected phones available for very inexpensive prices, but for some, the lack of features is a benefit rather than a drawback. By producing a phone that functions flawlessly for their target market who desires an easy-to-use device, Samsung may be tapping into a population that many manufacturers avoid. As far as the specific specifications go, the Galaxy J2 Pro has some decent specifications that should more than suffice for basic texting, photos, and calling. In addition to the QHD AMOLED screen discussed above, the phone will ship with 1.5GB of RAM which should give the phone the power it needs to function speedily far into the future. The 16GB of internal storage is rather low, but considering there won’t be any space taken up by applications it may be enough for the average user to store a significant amount of pictures and video. The storage is also expandable up to a whopping 256GB with a microSD, so space should be a non-issue for those willing to shell out for an extra card. The 8MP front-facing and 5MP back-facing cameras aren’t anything to write home about, but Samsung has a reputation for high-quality lenses and we anticipate the device should perform admirably given its specifications. The phone will run on Android 7.1 Nougat using a 1.4GHz Qualcomm Snapdragon 425 processor, and should comfortably last all day on a single charge with the 2600mAh battery – especially considering that there won’t be any web browsing or app usage to drain it of power. 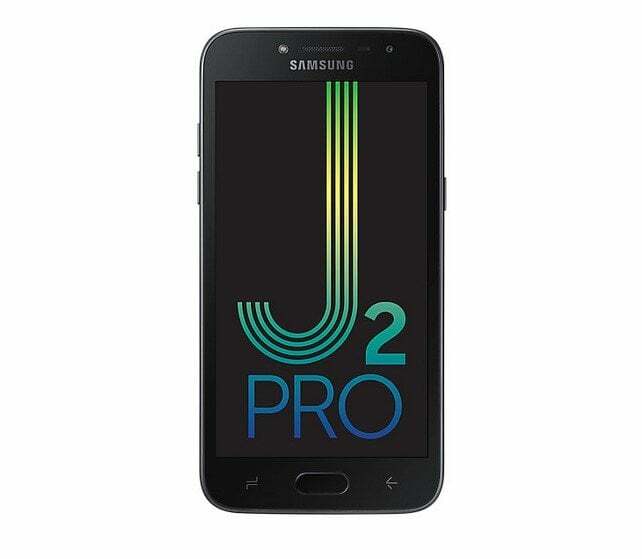 The Galaxy J2 Pro will be available in either black or Gold for around 199100 won ($185). This is a significant cost for a phone that doesn’t have access to the internet, but there should be substantial savings when it comes to the monthly cell phone bill due to the inability to access data. Currently, the company doesn’t have any plans to sell the phone outside of South Korea, but there’s certainly a demand worldwide for such a device outside of Korea. Whether Samsung chooses to launch the Galaxy J2 Pro outside of their home country will likely be based off of the success it sees after its initial release, but given the fact that the elderly population continues to increase, there’s certainly a demand for an easy-to-understand smartphone that gets the job done without any additional frills or add-ons. The lower monthly cell phone bills will also likely mean a lot to those on a fixed income, making the higher initial cost far more palatable. The Samsung Galaxy J2 Pro launched April 13 2018 exclusively in South Korea.